The Cheesecake Factory® is a unique upscale casual dining restaurant offering more than 250 menu selections including appetizers, specialty salads, pastas and pizzas as well as great steaks, burgers, sandwiches, fresh fish and seafood. Be sure to save room for one of our 50 delicious cheesecakes and desserts! The Cheesecake Factory® gift card can be used at any of The Cheesecake Factory® restaurants nationwide. 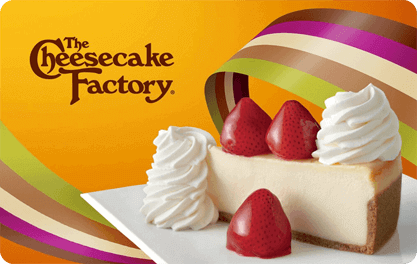 * To find The Cheesecake Factory® restaurant nearest you, please visit us at: thecheesecakefactory.com.